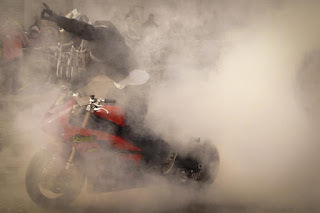 "super tuners" that cause motorcycles produce illegal amounts of air emissions. Last Thursday, Harley-Davidson Inc. acquiesced to pay $15 million to settle a U.S. government complaint over racing devices that caused its motorcycles to emit illegal levels of air pollution. The U.S. Environmental Protection Agency (EPA) and the U.S. Department of Justice (DOJ) alleges that Harley-Davidson manufactured and sold about 340,000 "Screamin' Eagle Pro Super Tuners" since 2008. These aftermarket devices allowed motorists to alter their motorcycle's emission control system. Also known as "super tuners", they increase a bike's power- and also the amount of harmful air emissions. The EPA began investigating Harley-Davidson after a standard inspection revealed violations. The EPA also found evidence that Harley-Davidson sold more than 12,000 motorcycles that were not covered by an EPA certificate of conformity and did not meet Clean Air Act standards. The Clean Air Act requires vehicle manufacturers to certify to the EPA that their vehicles will meet federal emission standards to control air pollution. The Clean Air Act also prohibits manufacturers from making or selling devices that bypass a motor vehicle's EPA-certified emissions. In the case of Harley-Davidson, the settlement will prevent the accumulation of hydrocarbon and nitrogen oxygen in our environment. Exposure to high levels of nitrogen oxygen has been linked to asthma and other respiratory illnesses; hydrocarbon contributes to ground-level ozone which has been associated with respiratory and cardiovascular disease. Per the settlement terms, Harley-Davidson will pay a $12 million civil penalty and spend $3 million to mitigate air pollution through a project that replaces wood stoves with clean-burning stoves in local communities. Additionally, Harley-Davidson can no longer sell these super tuners and they will offer to buy back all such tuners at Harley-Davidson dealerships and destroy them. Still, Harley-Davidson maintains that their actions were legal. According to the motorcycle company, the super tuners were made to be used on racetracks and not public roads. "This settlement is not an admission of liability but instead represents a good faith compromise with the EPA on areas of law we interpret differently. For more than two decades, we have sold this product under an accepted regulatory approach that permitted the sale of competition-only parts. In our view, it is and was legal to use in race conditions in the U.S,” Ed Moreland, Harley-Davidson's government affairs director, quoted the LA Times in a recent article. Although the some motorcycle enthusiasts might be unhappy with the litigation, the EPA has full faith that their endeavors are important and necessary for protecting our environment. “This settlement immediately stops the sale of illegal aftermarket defeat devices used on public roads that threaten the air we breathe,” said Cynthia Giles, assistant administrator for EPA’s Office of Enforcement and Compliance Assurance. The settlement, a proposed consent decree lodged in the United Stated District Court for the District of Columbia, is subject to a 30-day public comment period before it can be entered by the court as final judgment. To view the consent decree or to submit a comment, visit DOJ’s website.